Several years ago, we were introduced to Institute for Excellence in Writing (IEW) through our homeschool co-op. To say that this drastically changed how I approached writing in our homeschool since then would be an understatement. I was very excited to have the opportunity to review IEW's Fix It! Grammar with Brittany so that we could see if this might be the right grammar for her. For this review, we received Fix It! Grammar Book 2 - Robin Hood. This came with a student book and a teacher's manual. The student book is spiral bound and contains 33 weeks of lessons in 69 pages. It also includes 5 pages of grammar cards that are on thicker card stock, which I'll talk about in a minute, as well as a 45 page grammar glossary. The teacher's manual is also spiral bound. It's 208 pages include an introduction of the Fix It! Grammar program and a scope and sequence, in addition to the 33 weeks of lessons. The 45 page grammar glossary is also included at the end of the teacher's manual. In addition to the student book and teacher's manual, we have access to a free download of the student book e-book as well as 2 e-audios: Mastery Learning and But, but, but...What about Grammar? Since I only have Brittany using this, she just used the physical book, but if I had multiple children using the same grammar, having access to the e-book to print for additional students would be extremely useful. Fix It! Grammar takes the concepts from the IEW writing Britt's been doing and shows her how to apply them to editing her work. I absolutely love this approach to teaching grammar. Rather than doing a worksheet on just locating nouns or just adding quotation marks to sentences, Fix It! Grammar has her editing sentences from an actual book - Robin Hood. To me, this helps translate grammar into real world usage. The Fix It! Grammar approach helps to answer the question we've all heard, "But WHY do I have to learn this?" I can honestly tell her that I don't do worksheets on choosing the correct usage of your/you're or their/they're/there in my day-to-day life, but I DO use those words in my writing, and it is extremely important to be able to know which one to use. Each week introduces a few concepts for her to look for in the writing, with each week building on the previous ones. For example, Week 1 has her focusing on indenting, capitalization, articles, nouns, who-which phrases, and end marks. 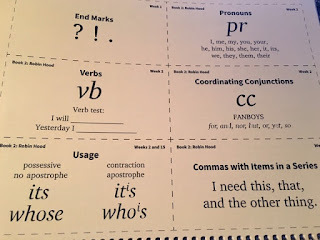 Week 2 adds pronouns, verbs, coordinating conjunctions, commas in a series, and its vs it's. Since this is Book 2 in the Fix It! Grammar series, the first few weeks address several concepts at once because they are review from Book 1. As the weeks progress and new concepts are introduced, the pace slows down a bit. Monday - Brittany and I go through the Learn It page, which introduces the concepts for that week. For the concepts that have an accompanying grammar card, we also go over what's on the card. Then she and I go through Day 1's passage together. First, she reads the sentence and we discuss the boldface word and look it up in a dictionary. She writes the word and definition in the back of her spiral notebook. Then we start marking the passage with the editing marks. So for Week 1, she marked to indent the sentence since it was the beginning of the story, drew 3 lines under each word that needed to be capitalized, marked the articles with "ar" and nouns with "n", and added a period at the end of the sentence. The picture shows her editing for Week 5, Day 1. Tuesday and Wednesday - Brittany marks Day 2 and Day 3 passages and turns in her book. I check it to see how she did and we discuss anything she might have missed. Friday - Brittany marks Day 4 and copies the week's passages into the front of her spiral notebook utilizing the editing she has done (indenting when needed, adding punctuation, etc.). By the time we finish Book 2, she will have the story of Robin Hood copied into her notebook. Here's what her notebook looks like so far. She has the rewrite of the story at the front of her notebook and the vocabulary at the back. One of my favorite things about Fix It! Grammar is the inclusion of the grammar cards. 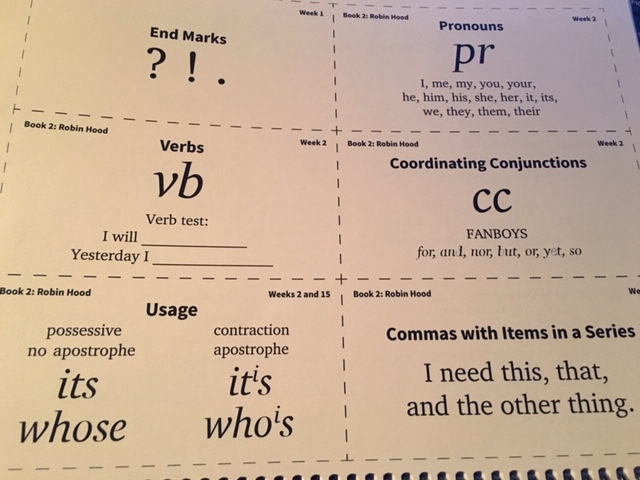 These are so handy for reminding Brittany about concepts she may be struggling with, for example, locating pronouns in her sentences. I can remind her to use the list of pronouns on that grammar card to go back through her passage to find them all. Each card is labeled with the grammar concept as well as the week that concept is introduced. To make it easier for Britt to keep up with the cards, we have opted to leave them in the book, and she just flips to the back to use them. Another option would be to cut them out and store them in an index card file box. I think that when I have to rewrite the story into my notebook, it is helping me with my writing skills. I like that when I'm looking up the vocabulary word in the dictionary, I have to figure out which definition is the best match for how it's used in the sentence. This is helping me with my vocabulary. Marking the sentences is helping me with understanding what a noun or a preposition is so that I can mark it. IEW offers 6 levels of Fix It! Grammar - The Nose Tree; Robin Hood; Frog Prince, or Just Deserts; Little Mermaid, Chanticleer; and Sir Gawain and the Green Knight. I am excited that we seem to have found the right grammar for Brittany, and that we can just continue up the levels. Are you interested in what other reviewers have to say about Fix It! Grammar? Check out more reviews from the Homeschool Review Crew.